Tablo 8 tablet review - this 8-inch affordable Android 4.0 IceCream Sandwich tablet offers average performance at a very good price. 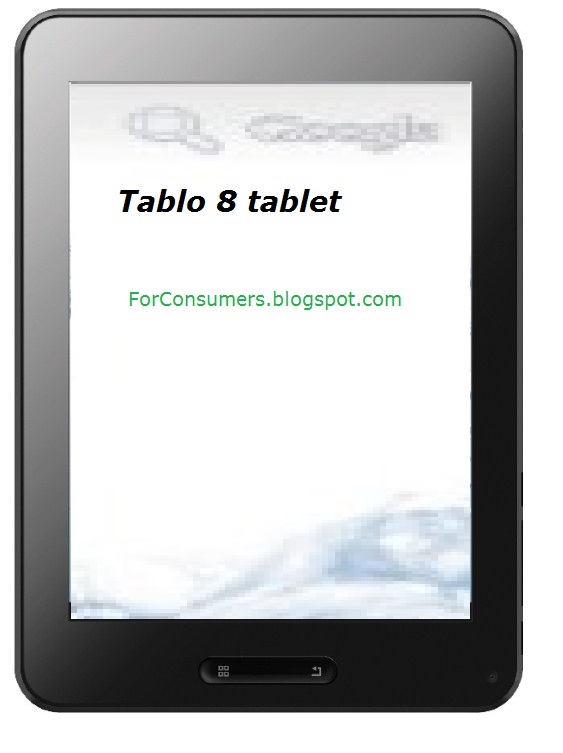 The 8-inch capacitive multi-touch display of the Tablo 8 tablet is bright and visible in daylight. The responsiveness is OK but it definitely could be better. It has native resolution of 800x600. The hardware performance of the Tablo 8 tablet is provided by 1.0Ghz A10 Cortex A8 processor. Of course this is not the best in class but lets not forget Tablo 8 is quite an affordable tablet. This tablet comes with just 512MB of DDR3 RAM. The space for storage in Tablo 8 tablet is 8GB but you can easily expand it with additional microSD card (up to 32GB supported). Multimedia features include front facing VGA camera and 3D/HD output to your high definition 3D TV (thanks to the Dual Mali-400 2D/3D Core integrated graphics). The battery of the Tablo 8 tablet will hold charge for around 4-5 hours depending on the apps used. Tablo 8 tablet comes preloaded with most of the software you may need, but of course as a fully functioning Android 4.0 IceCream Sandwich tablet you can use some of the thousands of applications in the Android Market. As I already said Tablo 8 is quite an affordable table, it's price is around £100 (in UK).